“Good morning everyone, and in fact what a very good morning for the football club. 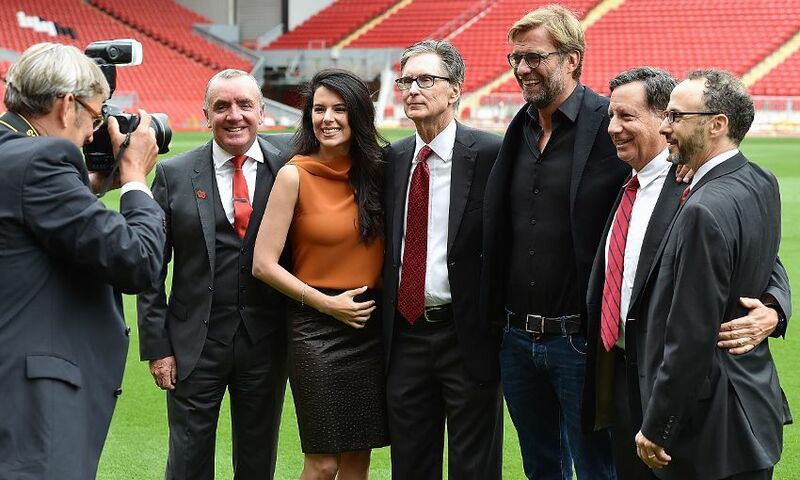 I was talking to John Henry a little while ago on the pitch and I reminded him of the first day that I ever showed him and the other directors of FSG around the stadium and he said to me at that time ‘Why would we ever move from here?’ Why indeed. It’s certainly a great honour for me in my professional career and time at Liverpool to be here today to welcome you all to the opening of the new Main Stand. This memorable occasion is something that will go down in the history of the football club and something we’ll all look back on. All of you here today can feel like you’ve been part of today’s history but also played your part in creating this fantastic structure. “I want to start by welcoming a few people. I’ll start by welcoming our owners from Fenway Sports Group, who are represented here today by John, Tom and Mike. They are also joined by other partners from FSG, and in a moment you’ll be hearing from our chairman Tom Werner as he makes his remark. It’s important to say that this stand was their vision, really their vision from the start of their ownership. It’s fantastic to see their vision become a reality today. “I’d also like to welcome some key partners from the Anfield partnership. There are so many that have helped, it would be impossible to name-check them all, but you all know who you are and the important role you have played. And also particularly to welcome our friends from Liverpool City Council and Your Housing Group, who were such an important part of this project and importantly the wider project we have been involved in, which is the regeneration of the local area. I’d like to thank them particularly for all their support in helping us achieve this. I couldn’t go without thanking Carillion, our construction partner – their management and importantly their workers, who did a fantastic job. What can I say other than to congratulate them on a truly breath-taking structure? “We’re also privileged today to be joined by some significant guests and special guests. We have our manager Jürgen Klopp here, who will lead the team out tomorrow in what will be the first game under this fantastic structure and our first home game of the season. We’re also joined, thankfully, by former players and managers, who are all emotionally invested in this place. They have all played their part in making Anfield a home where memories are made for Liverpool fans. They are just as important, I think, as bricks, concrete and glass. “I’m pleased to say we have representatives of the Shankly and Paisley families here today. Their presence today is really appreciated and I hope their ancestors would look down on this fantastic structure and feel that not only have we achieved a great building but we have retained all that is uniquely Anfield. A lot of people who I have spoken to today have commented on how this looks like it has always been part of this stadium. Hopefully we remain here in our spiritual home and I hope that those people would be looking down thinking we have done that in a ground that they had so much influence on as managers. “We have some ward councillors here today representing Anfield community and its residents. I have to say, the engagement and relationship with the residents throughout this process has been a really key part of this. We are the biggest neighbour with the biggest house in this area, but we have fantastic neighbours ourselves. They have been an important part of putting up with all the noise and disruption around construction. I hope we have been as good a neighbour in the process. It’s only by working together that made this possible. “We’re also joined by some of the Hillsborough families, represented by the Hillsborough Family Support Group today. Those of us who remember that day on April 15, 1989, and the emotional days and weeks that followed, will remember how significant a part Anfield played in providing a focal point for families, survivors and supporters. Great to have them with us here today. “Importantly, I’d like to particularly thank the entire team of staff and directors I work with here at the club. There is no project, certainly in my 10 years here, and no piece of work that has ever drawn on so much time, effort and commitment from every member of the club’s staff. They really are a credit to the club and themselves. Like all of you, they will be able to look back and tell their families, both now and in the future, that they played their part in building this great part of Anfield’s history. “If I’ve missed anyone out, I’m sure you’ll forgive me today. It has been a project where so many people, so many groups, individuals and organisations have come together to achieve something so very special. I wasn’t going to single out any individuals, but I have to say certainly from my team there are two people – Andrew Parkinson, our operations director, and Tom Doyle, who was the project director for this fantastic piece of work. They really went above and beyond and they deserve a particular special thanks. “I’ve been coming here myself personally for about four-and-a-half decades now and I have some fantastic memories of coming here, be it standing on the Kop as a 14-year-old when we beat Saint-Etienne in 1977 or sitting up in the old directors box last season when we beat Borussia Dortmund in that fantastic game, as chief executive. It will never change for me. Those memories that you have are the things you take away from a great stadium like this. It is the personal memories, it is being here when you experience a great night or great day. I’ll leave here next summer as the CEO, but just like every fan who comes here every week, my memories of Anfield will always be with me.